Our graduation stoles are an exceptional way for students within a group to remain a unit while standing out amounts their fellow graduates during their ceremony. 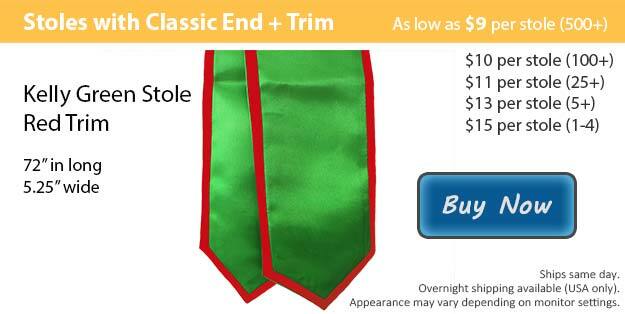 We have a kelly green stole with red trim that just might be the stole you need to wrap up your graduation outfit. Earning your degree or diploma is not something that comes easily. It has taken years of remaining focused and giving it your all to successfully reach your goals and make it to graduation. We have all of the gear that you're looking for to be ready in time for your ceremony. Your graduation day is an unforgettable experience and it is extremely important to dress properly. Your graduation is a time for your family and friends to all get together and show just how proud they are of you for all the great things you have accomplished. Follow the tradition that is practiced around the world by dressing in a graduation cap and gown at the time of your ceremony. At Honors Graduation we're here to help you prepare your entire wardrobe. From our bundle deals to our many accessories, Honors Graduation is your one stop shop for all your graduation needs. We have an excellent variety of options available for our graduation stoles here at Honors Graduation. Choose your style, length, and even your colors. We have two styles that are both available in lengths of either 60 or 72 inches. Pick either the classic finish or our angled cut. As for your stole and trim color, we have eighteen different choices that you can mix and match with to create the perfect stole to go with your outfit. All stoles can be purchased with or without the contrasting trim. We can even add the image or wording of your choice to your stole to create a more personal product.